This is the Lite edition of CyberLink PowerDirector 16. I really like the 360 panorama editing function. The interface is easy to use. I am beginner of editing videos just for a hobby. This is very easy, and strong, I think. 5 stars because I already had a Cyberlink suite 10 preinstalled and already had Cyberlink 12 and 14 from giveaways ( you can install as many as you like, apparently! ) and version 15 ( 64 bit ) is by far the best, does everything I needed it to do to edit and add sound to my video and have it come out synced and without distortion, and although it can be a bit tricky to figure out and you do have to buy some features ( I never have ), right out of the box it is perfect for everyday video creation and editing, and I don’t know what the complaints are about output formats as I see many options and used several of them to test for sound quality and video quality and they all produced good results. If you want perfection, you have to pay for it along with a steep learning curve, but for my needs and I would assume most peoples’ needs, this is just fine and it’s free. Video creation and editing process has been exclusive to the pros in this field, due to limited knowledge and limited access to pro tools due to cost and ease-of-use. However, with the advancement of technology, many applications are now available for the novice users to be able to perform this tasks on their own. Most of these applications are not upto the mark, do not perform well, and produce low quality result that are no way near the professional work. CyberLink PowerDirector 15 is a fast and reliable video editing tool, designed for consumers, to help them edit videos, create projects, add effects and transitions, burn media on discs, and do a lot more. It comes with all the right tools that enable you to create, edit, and handle multimedia projects with ease to produce satisfactory results all by yourself. The installer size is ~568MB and can take some time to download on the slower internet connections. The installation process is pretty simple and straightforward, takes only a few minutes to install, depending on your systems hardware specification. Before you can launch the application, it asks you for the license code so that the application can be activated. After launching it, you are first presented with a screen that enables you to adjust some basic settings and let’s you choose the mode you want to launch the application in. There are six options to choose from, namely Full Feature Editor, Easy Editor, 360 Editor, Express Project, Theme Designer, and Slideshow Creator. You can choose the one that suits your need and start working with it. The UI of the application comes with a modern design and dark background so you can focus on what actually matters. It is clean and well-arranged, and follows the same design pattern as other similar tools. The layout is not cluttered, but for novice users, the may find it overwhelming, as it comes packed with a plethora of features and tools. Like most of the applications in this category, this application too comes with two windows on top, and the timeline covering the whole bottom area. From the above two windows, the left one is the library that has Windows Explorer like functionalities, and to the right is the preview window. The UI requires sometime to get used to for the novice users, but once you’re familiar with it, you will be good to go. The UI is easy-to-use, comes with multiple modes to suit your needs. Comes with a plethora of tools ranging from basic to advanced. Create collages using picture-in-pictures templates. Burn your work or project on discs. The UI might be overwhelming for some users. Better and professional looking effects offered in other similar applications. Output quality far behind it’s competitors. CyberLink PowerDirector 15 comes with a extensive tools and features, that produce decent results. The application is easy to use, one you get used to the interface. It runs smoothly, without any lag or crashes. The video rendering speeds, and the disc burning speeds are quiet impressive. It is definitely worth-trying. Editing very good, but capture from a DV camcorder leaves a lot to be desired. Windows Live Movie Maket did a better job! Video editing has become very common so do the software that could help you accomplish that task. For the longest time, the practice has been an exclusive to the pros. If you wanted to get into that space, you had to spend some time learning how to use the rather complicated video editing packages like Adobe Premier. Thankfully, CyberLink PowerDirector 14 tries to change all that. Here is what I found out about this program. Although CyberLink PowerDirector 14’s installation file of 736 MB, is smaller than those of professional packages, a stable internet connection will come in handy during the downloading stage. After that, you will have a breeze as you install the program guided by the installation wizard. On launching the program, you will be greeted by a nice interface that presents straightforward video editing tools. It is clear that CyberLink was out to ensure this editing piece is easy to use. To start with, the video editing tools are simple yet give you the control you would expect from an editing software. In addition, you could take advantage of the Express Projects that will guide you through the video editing process to help you hit the ground running. These projects will be more helpful to novice users. While using CyberLink PowerDirector 14, I did not feel that it was limiting me regarding the editing steps I wanted to execute. As such, I was able to manipulate my pictures, add effects, insert transitions, rearrange my video footage on the time, and trim pictures. Further flexibility was in the loads of transitions in the library. It is common to end up with a shaky video footage when using your camera. If that is the case, you do not have to worry since CyberLink PowerDirector 14 has you covered. I was impressed by how it was able to not only stabilize the footage, but also make it easy for me to sync audio and video from different sources. While using CyberLink PowerDirector 14, it is like you will get good results in terms of the final audio if you plan well before recording your videos. In my case, I noted that it was not able to automatically balance the audio levels from my different video files. At the same time, the general audio of the edited videos was below par. This version of CyberLink PowerDirector 14 falls short of some extra tools that are in the Ultra suite. After you have found your footing with this package, you would miss out on the extras. You will need extra money to get those additional tools. If you do not want to pump in some hours into learning a video editing software, then CyberLink PowerDirector 14 could come in handy. The program has a nice interface with straightforward editing tools at your disposal once you are through with the installation. For advanced users, the Ultra suite will be more suitable. Basic editor, it’s the Limited Edition, good to know. Many features of the full version are disabled in the LE version. I’m not sure what others are having in mind. One can totally produce 1920×1080 mp4(mkv, mt2) file with this software. You just have to choose from the dropdown presets. Yes, it’s basic functionality, but for some it could be quite enough. Korean Review: 초보자가 사용하기에 편리한 동영상 편집 프로그램입니다. 한글도 지원하며, 다양한 옵션을 지원하여 동영상 제작에 있어 뛰어난 성능을 보여줍니다. 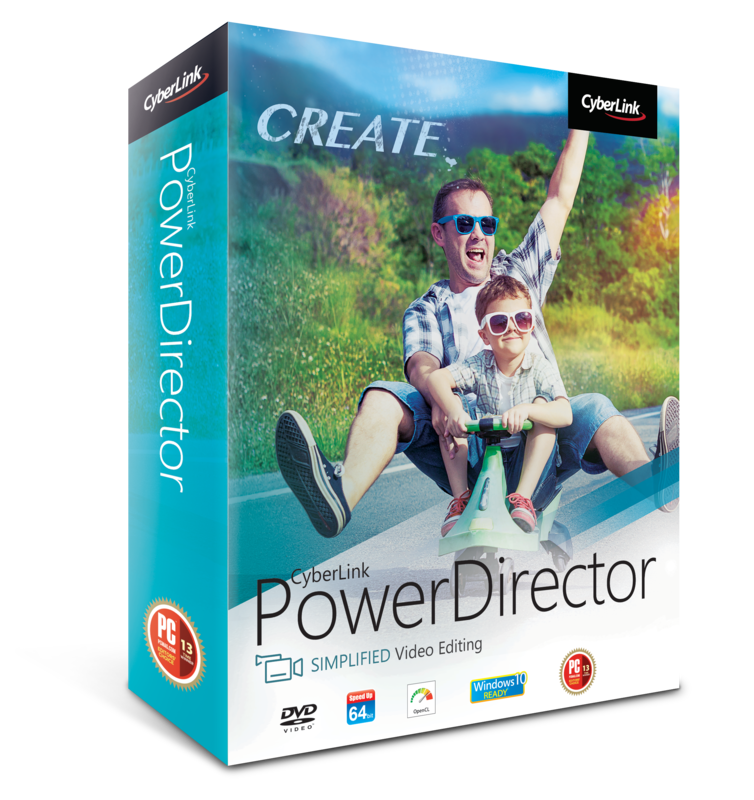 If you have a PC with a high processing power, you can enjoy creating wonderful videos with Cyberlink PowerDirector 13. This software contains an outstanding video processing package that allows for editing of everything from sound, to pictures and video resolution. Cyberlink PowerDirector 13 is about 750Mbs, which is slightly lighter than most video editing software. Downloading is easy. The installation wizard also makes installing the software very simple even for novice users; you only need to choose a couple of options (personal preferences) and it will handle the rest by itself. As long as you are running a Windows 7, 8, or 10 OS and your PC has a decent screen resolution, 5GB HDD space, 512 MB memory, and a decent CPU, the software will work perfect. Simply fire it up, and all the editing tools will be available at your disposal. Cyberlink PowerDirector 13 allows you to capture media from various sources including a Digital TV signal, Webcam, CD/DVD, a microphone, or a DV/HDV/AVCHD Camcorder. Other options include your harddrive or removable media. If you are working on a large scale project, it will be best if you arrange your content into subfolders for easy access. Although the program also creates shadow versions of the files for easy access, it doesn’t support geo or face-tagging. This means that you will have to do most of the organizing work by yourself. Cyberlink PowerDirector 13 comes with a wide range of audio and video editing tools that perform various functions including improving the quality of a video, joining sections of a video, deleting corrupted parts, removing noise, and improving the lighting. It also has many effects and transitions that help improve the looks of the video when rolling credits or changing scenes. Another feature worth mentioning is the particle designer which adds special effects to movies. Most of these effects are impressive and you can also adjust their intensity, speed, and even direction. The Cyberlink WaveEditor allows you to completely edit audio files by adding effects, cancelling noise, reducing noise, and changing the speed. Cyberlink PowerDirector 13 is easy to use. You do not need to have prior knowledge for you to do a simple edit. It is fast and works smoothly as long as your PC meets the required specs. Although you can easily edit video files, you can only save them as MP4, which means you will only play them on a limited number of devices. It works best on powerful computers so do not expect a similar experience when using a slow PC. The DVD version also creates DVDs that have a lot of shimmer and actually look awful. It doesn’t provide videos in full HD, which you will clearly notice their blurry look when playing them on a HD screen. The software provides many editing options that are difficult to find on any free video editor. It is also easy to use. However, the quality of its videos is questionable and the ability to save in different formats isn’t availed. It is worth downloading, but do not expect so much from it. Software is fantastic for basic video editing. Full featured but pretty easy to pick up and learn on the fly. Unfortunately, this free version only allows you to produce a final video as an .mp4 file. Any other file formats or containers require an additional purchase. The software also does not let you output video in a resolution higher than 640×480 unless you make an additional purchase. Still, for free, it’s worth it. My only other comment is that it does not automatically balance audio levels from different video clips and it does not appear that there is a way to measure the DB of different clips in the software. I think You meant version 14, not this version!